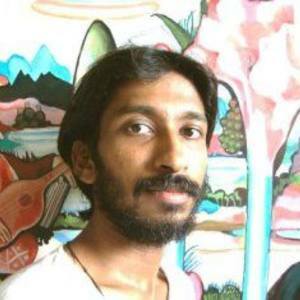 Sukesan graduated in sculpture from the Government College of Fine Art, Trichur in 2003. A recipient of the Shilpapaddiam First Biennale Art Award and the Lalit Kala State Academy Award,he is a rare, young artist to work in pen and ink.An avid reader, the philosophies of Jacques Lacan and Sri Narayan Guru have had a deep impact on his psyche. His drawings are surrealistic, fascinating and imaginative; a visual filigree of nightmares, dreams, fantasies and unfulfilled desires that are reminiscent of the works of Albrecht Durer and Hieronymus Bosch.A goldsmith by profession, he demonstrates the same keen sense of observation and attention to detail in his works. Sukesan has participated in The Harmony Art Show organized by the Reliance Ambani group, "˜Border Lines' curated by Johny ML at the Shridharani Art Gallery and A4Arple show at Gallery Ragini. He has also exhibited at shows curated by Anubhav Nath at the Lalit Kala Academy and the Ojas Art gallery in New Delhi in 2011-12 and in theArt Bengaluru and the Mumbai Art Festival.